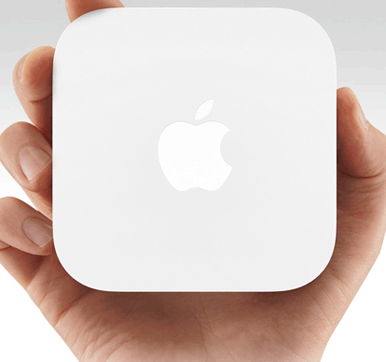 The redesigned 2012 model of the AirPort Express Wi-Fi base station has become the mouse that roars. The revisions transform this model into a tiny powerhouse by adding to its previous modest attributes a second ethernet port, simultaneous dual-band Wi-Fi, and a guest network option all in a form factor identical to the Apple TV (except white and an ounce lighter). 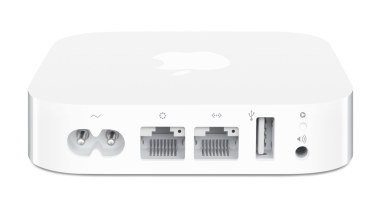 At the same $99 as the previous two models, the AirPort Express might serve an entire apartment or single-floor home, or act as a main base station to which other base stations are chained via Wi-Fi or ethernet, where previously the $179 AirPort Extreme base station would be required. The Express uses the same configuration tools and options as its bigger siblings, the Extreme and Time Capsule. In testing, performance and throughput are in line with those models. 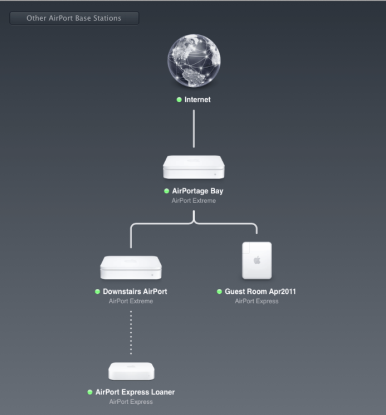 AirPort Utility: An AirPort Express can be connected wirelessly, indicated by the dotted line in AirPort Utility, to an existing network to provide fuller coverage. While the previous AirPort Express (2008) supported 802.11n networking, you had to make a choice to set the Express to use either the 2.4GHz or 5GHz band available for 802.11n, not both at the same time (known as simultaneous dual-band). Having both bands available at once in the 2012 AirPort Express (a feature added in 2009 to the Extreme and Time Capsule models) allows your network to perform at the highest possible speeds no matter how distant a device is from the base station while it remains in range of a signal. That’s a significant improvement, and makes the Express a much better value, especially compared with equipment from competing manufacturers, such as Linksys. Competitors have offered relatively inexpensive simultaneous dual-band gateways for years, but those models lack Mac-specific features, such as Wake on Demand. The AirPort Extreme and Time Capsule models (since 2009) have one advantage in the radio department over the Express. In 802.11n, the radio system can use varying amounts of power across the multiple antennas used to send out data to “steer” a signal (think of multiple cue sticks hitting a pool ball to control how it caroms), and create separate data streams at full throughput across different paths in space. The Express has two streams, while the Extreme and Time Capsule offer three. This approach allows a three-stream router, like the Extreme, to have an effective raw throughput of 450 Mbps in 5GHz and 225 Mbps in 2.4GHz, while the Express is limited to 300 Mbps and 150 Mbps, respectively. In practice, the net throughput might be just 10 to 30 percent higher for an Extreme or Time Capsule over an Express (say 130 Mbps instead of 100 Mbps), and if you’re that concerned about throughput, you may need to use wired connections in any case. Apple’s AFP file-sharing typically peaks at much lower rates than these maximum data rates. The additional antennas required and the additional stream also fill in hard-to-reach spaces with better Wi-Fi coverage. For larger homes or offices, or ones that have dead areas with an Express or other Wi-Fi gear, the Extreme or Time Capsule may be required. Ports: (left to right) Power, ethernet WAN, ethernet LAN, USB, and audio (analog/optical). The AirPort Express once had a single ethernet port, which limited how it connected to a wired network. You could either plug it into a broadband modem and share access via Wi-Fi (including to other base stations), or connect to it a network switch to extend an existing Wi-Fi network. You could not, however, use it as both a wired and wireless main base station connected to the broadband network. Older models could also extend an existing Apple wireless network (that feature still exists) and use the single ethernet port to provide access to wired machines. The new second ethernet port opens up the Express by allowing both a Wide Area Network (WAN) connection to a broadband modem or a larger network, and a Local Area Network (LAN) connection to a computer via ethernet, or to an ethernet switch to which many computers and devices can be connected. The Time Capsule and Extreme each have a built-in three-port gigabit ethernet (10/100/1000 Mbps) switch, while the Express continues to use 10/100 Mbps ethernet on both its WAN and LAN ports. However, the 100 Mbps limit doesn’t affect data exchanges between Wi-Fi devices, which work at the maximum wireless rates available, and it’s easy enough to plug in an inexpensive gigabit ethernet switch to allow the fastest throughput between wired devices. Only two particular situations require an Extreme or Time Capsule because of the ethernet limitation: if you have a broadband connection of faster than 100 Mbps, which is uncommon, but becoming more widely available; or you are determined to have the maximum possible throughput between ethernet and Wi-Fi devices on the same network. Guest networking has also been added, which allows a second virtual network with a unique network name (SSID) and security scheme to be available to visitors or others without providing access to the main network. Guest users can’t sniff or have access to Bonjour resources (like shared printers or file servers) or other traffic on the main network, either. This has been in Apple’s full-sized base stations for years, and it’s a nice feature to find in the $99 model. Apple also brings over the option from the other simultaneous dual-band gateways of naming the 2.4 GHz and 5 GHz networks separately. That lets you choose to have a device connect to one band or another if it has the option of connecting to either. On some combinations of devices and networks, it can be useful to force 5 GHz for throughput or 2.4 GHz for range. Previous models had an integral two-prong power plug (in 110-volt countries) that allowed them to hang directly off a wall outlet or fit into a power strip. The base station was heavy enough that it could easily fall off the outlet, and locating it by an outlet or a power strip could often mean that signals were blocked by furniture. A separate cord with a three-prong plug was only available as part of a $39 A/V kit. The 2012 Express (in the U.S. edition at least) has a 6.5-foot (200 cm) long two-prong cable that allows it to be more easily placed. It’s also attractive enough, unlike the unit it replaced, to sit on top of a TV cabinet or table. The 2012 Express, just like the two preceding models, can only share a single USB printer using Bonjour. The Extreme and Time Capsule use Bonjour sharing for a printer or hard drive (via AFP and Samba) through a USB port, but also allow the use of a USB hub to share multiple devices. The quibbles about USB and ethernet are relatively minor compared to the features available in this mighty mite. For the money, the Express makes an effective base station for modestly sized apartments or homes, or where access is only needed in a few adjacent rooms in an office. This sleek model is the right choice for many, and at $80 less than the AirPort Extreme, a prudent one as well. Editor's note: Updated on 6/25/12 at 2:22 p.m. PT to clarify that an older AirPort Express could either be plugged in via ethernet to a broadband modem or a local network, but not both at once.